The Museum business office is open year round during normal weekday business hours. The museum was re-dedicated on November 23, 2008 after extensive renovations. can view to get a sense of the crowd and excitement. 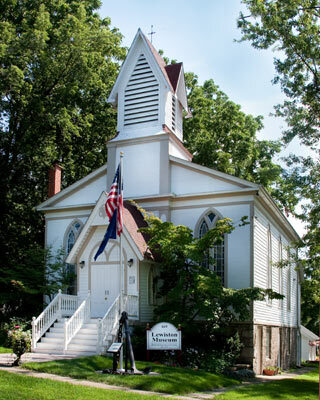 The Lewiston Museum was built as St. Paul’s Episcopal Church, the cornerstone being laid in 1835. Dennis Harrison and mason James Wilson constructed the small church. The architect is unknown. A balcony extended across the northern interior wall. The first rector of this historic church was the Reverend Rufus Murray, posted to Lewiston as a missionary in 1838. He remained in Lewiston for nine years, keeping detailed records. During this time, he documented that he provided burial services for at least three “strangers”, the euphemism for passengers on the Underground Railroad. The two adults and one “child of a stranger” were buried in unmarked graves in the Lewiston Cemetery, presumably to foil slave-catching agents and prevent exposure of the abolitionist activities of the minister and his congregation. The Reverend Murray was later sent all across Western New York providing services to Jamestown and Westfield churches, among others. He then moved on to Michigan serving the Mariners’ Church in Detroit, famous for its mission to seamen, and the church at Adrian, Michigan. All his churches were known to support the Underground Railroad and freedom from slavery. His sermons were much requested, including Jamestown’s Dr. Elial Foote, who was of “the same political faith and creed” of the Reverend Murray. In response to Dr. Foote’s request, Reverend Murray, Rector of Christ Church, Adrian, Michigan, replied with a published sermon from July 2nd, 1854. In his sermon, he lauded the nation’s birthday two days hence, and asked that the Union and peace be preserved. He states that Northern men can never sympathize with slave-holding associations, and argues against separation of North from South. An 1889 renovation resulted in a new vestibule, dismantling of the balcony, gothic windows, and a rear addition on block piers. When the new St. Paul’s church was constructed in 1955, the Lutherans began services in the church, and in the 1960’s the Baptists purchased the building. When the new Baptist Church was constructed in 1973, the building was sold to the Historical Association of Lewiston, its current owner and operator. In 1974, the new History Museum began displaying exhibits mounted by local service organizations, including Femmes En Force, Inc. and the Lewiston Service Guild. In 1989, the rear addition was expanded for collection storage. A new roof was added in 1996. In renovation to the lower level meeting space undertaken in 2002-2003, a “hidey-hole” was discovered in an interior stone wall — large enough to hide possessions or a small person. A 2003 evaluation of the building funded by the Institute for Museum and Library Services found that structural and environmental changes need to be planned for and funded. The Museum was closed in 2007 for a major renovation and redesign of the exhibit space. During the 18 month closure, the Museum was insulated, a new furnace and air conditioning system installed, new fire and security system was added along with new front steps, a new flagpole and new Cibola Anchor exhibit in front of the building. An extensive remodeling also took place on the main exhibit floor including a rehab of the original hardwood floor, and the inclusion of permanent wall exhibits and LCD monitors. The entire $50,000 project was funded with grants from The East Hill Foundation, State Sen. George Maziarz, the New York Power Authority, and Seneca Casino funds from the office of County Legislator John Ceretto. The Museum re-opened on November 23, 2008, with a large crowd of supporters in attendance. The Lewiston Museum is a facility operated by the Historical Association of Lewiston, a private, non-profit organization. The Association and Museum are operated and maintained by volunteers and two part-time staff members. Your donation of time and money to The Lewiston Museum is much appreciated.